Many of us have been there and done that. That is, getting back into running after time off. For some it is after a few months but for many it is years. Whether you stopped running because life got in the way, time just didn't allow it, injury forced you to stop or you simply lost interest, returning to running is certainly do-able and in fact you might be stronger and fitter than you realize. Yo might be excited and really pumped up and motivated about getting back into running, but maybe there is also a wee bit of fear and trepidation and wondering how to go about it and can you in fact make a comeback. 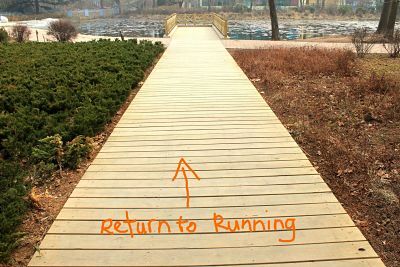 Well you certainly can restart running and often it is easier than you think. Our bodies and brains have a great capacity for memory so although you might feel a bit creeky to begin with, your brain and muscles will still remember what it was like to run. If during your time off, you were quite active, whether it was from walking, daily physical activities such as gardening, playing with the kids, other sports such as cycling or basically time spent on your feet, you may well find that your aerobic base is pretty good or even better than you think. What will need tweaking and getting up to speed is building up strength in unused muscles, tendons and ligaments and basically getting your body re-used to running and training your brain to think positively. If you have been away from running for years, you will probably have memories of your faster younger self. That is a great motivator. However be realistic and remember that even though in your mind you are young, your 40 year old plus self does not have the same body as your 20 year old self. Don't compare yourself to someone not in your age category or someone who has put in more miles and more training as that will just frustrate you. The sensible approach when getting back into running is to take small steps at a time. Set yourself a goal whether it be running X times a week, building up your run to an hour or running a 10km race and give yourself a few months to work towards that goal. Once achieved then set yourself another goal. You'll feel much more positive that way and are less likely to get injured. When you are getting back into running, the injury rate is potentially high. You are possibly a bit out of shape and you are in a hurry to be back running like you were all those years ago. Your inclination might be to ramp up the miles as quickly as you can. But please don't, even if you feel in great shape. Spend some months in the "easy zone" and you'll be far better for it. The best way to avoid injuries is to be in tune with your body and your capabilities. Spend a few weeks assessing what sort of running shape you are in. Go for a few short 20 minute gentle runs and see how you feel. If you huffed and puffed and ached all over you know that you need to start slower. If it felt comfortable, your breathing wasn't strained and your muscles felt strong, then you know that your comeback might be easier than you think. In both cases, still don't rush back into high mileage and fast runs even if you think you can do it. Start slow, train slow and increase your mileage very gradually every couple of weeks. Often an injury can be looming before we even feel it. Are you more likely to get injured as an older runner? As we get older, we lose muscle strength and tissue elasticity. Consider adding in strength training activities if you don't do them already. Many older runners already do cycling or walking which are great ways of improving your aerobic capacity which in turn is a vital building block for faster and safer running. Making a comeback into running is exciting. The thrill of tying up your laces and heading out the door can be quite intoxicating. Think of the comeback though as not so much a comeback to how you were five, ten, twenty or more years ago, but more a comeback into enjoying running. The best thing to avoid disappointment, is to not to think, "In 6 months time I want to be able to run a 10k at a pace of......". Much better to think, "In 6 months time I want to run a 10k". Forget the pace. The pace will come naturally and gradually, depending on what your body is capable of. Don't rush getting back into running and you'll drastically avoid injury. Better to start with a few months of short, easy runs rather than rushing straight in with long and hard runs. I am a strong believer in heart rate training as I feel that is a much safer method of training especially if you are making a comeback. Re-asses yourself every month and then increase mileage slowly if you are feeling strong. Give yourself a good 12 months to get back in good running shape and then you'll not be disappointed. After you've been getting back into running for a couple of months, think about what your original goal was. Was it to do a race, to lose weight, to get fitter or to run for fun?.See how you are progressing and then see how you can improve to achieve your goal. Some people feel ready at this stage to join a club or perhaps to hire a personal coach. Others are just happy to do their own thing or to team up with other runners their own level. The main thing is to not push too hard in the first 6 months and to re-evaluate every month to see how you are doing. If you have any aches and pains that won't go away, don't hope for the best as chances are they will develop into something more serious. Do a bit of homework and work out if you have any muscles imbalances or perhaps you could do with a bit more strength training or an extra rest day. It often helps to have a training plan or a goal. This keeps you motivated and accountable. However don't be afraid to adapt the plan, move the goal posts or take an extra day off. Do not be a slave to a training plan but use it as a guide. How to choose the best training plan for you. Older runners need more recovery time. That is just a fact of life. It doesn't mean that you can't run as often, but better to run by time most of the time rather than by mileage and to factor in sufficient rest days, especially after a long or hard run. Tune into your body after each run and see how you feel and make adjustments to your comeback training if necessary. So get those trainers on, head out the door and enjoy yourself!